If you want something that is big, powerful and fast, then this is the beast you are after. 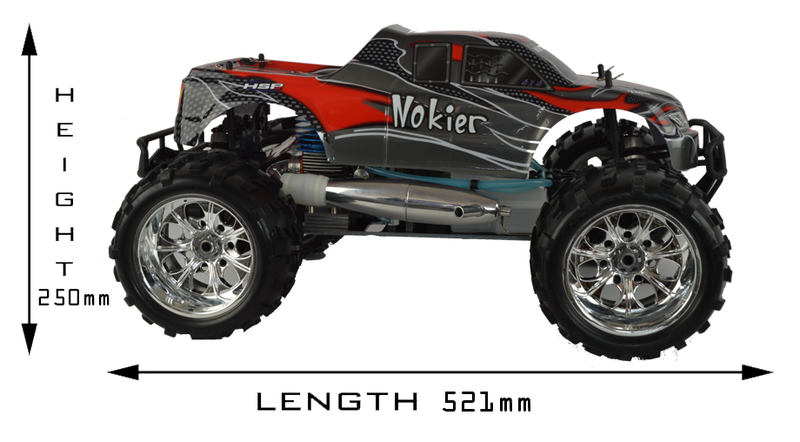 This a large 1:8 scale nitro monster truck that features a two speed automatic gearbox, three differentials with hardened gears and a fast SH .21 nitro engine. 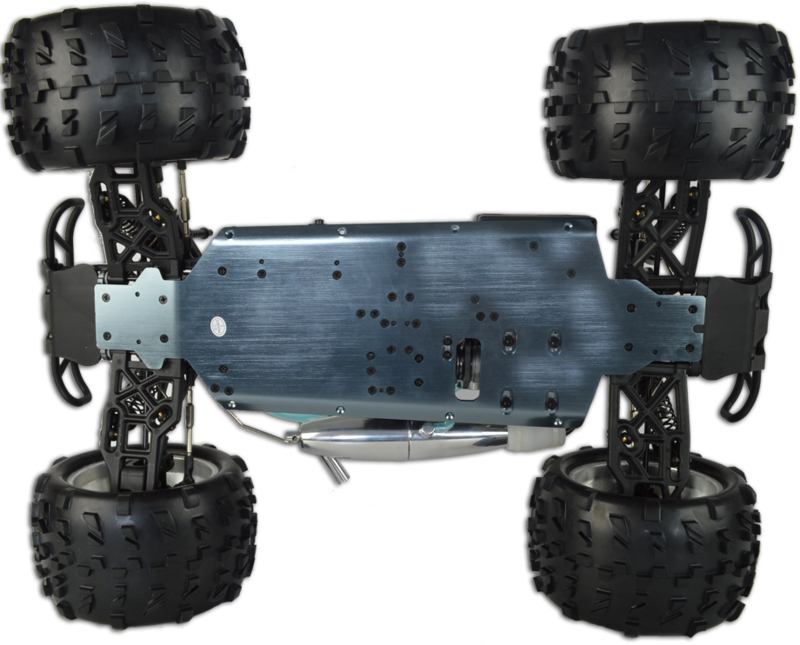 This awesome monster truck is packed with features including a solid aluminium chassis, extra large fuel tank, upgraded aluminium parts and over-sized knobbly off-road tyres. The exhaust has been upgraded to a beautiful polished aluminium version which works with the SH race engine to give serious power. With this product, you earn 202 loyalty point(s). The bigger size with aluminium chassis and parts make the monster truck very tough and a good all rounder performing well both off and on road. The full four wheel drive system with independent aluminium large shocks takes care of the off road while the front and rear sway bars add to the performance and handling on road. A big fast model like this needs a lot of stopping power but this is not a problem here with the powerful disc brake system taking care of business. 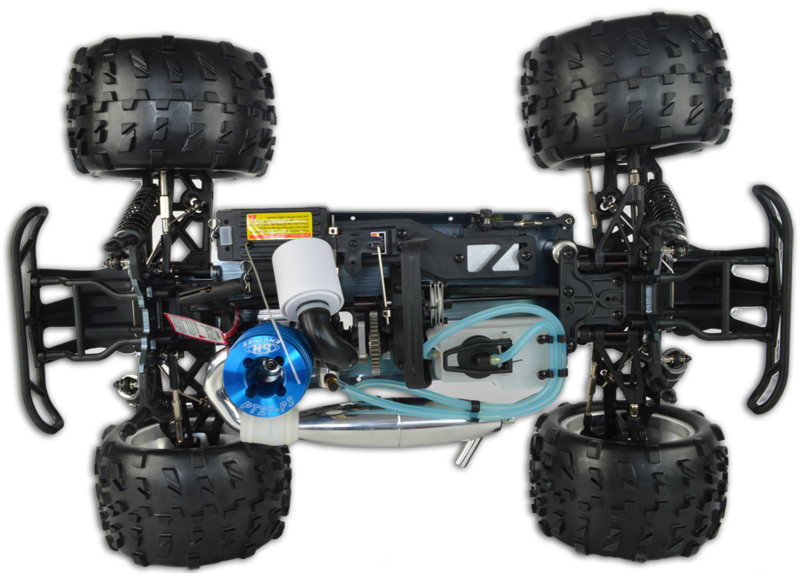 The truck is ready to run out of the box and comes complete with 2.4Ghz radio equipment that allows multiple models to be used in the same area without interference, and a pre-painted body shell. 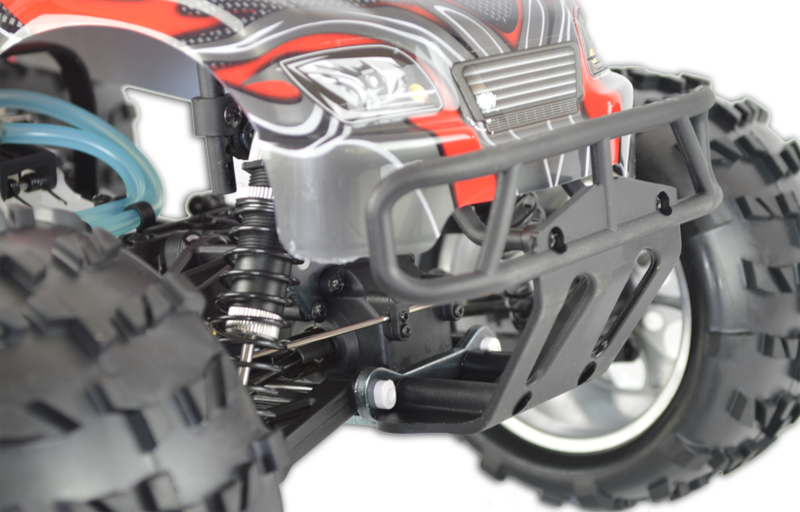 All you need is fuel, 12 AA batteries for the radio and a glow starter and you will be tearing up your favourite patch of dirt, leaving others in your dust with all the noise and speed of a real off roader! Provides extra protection in case of impact. 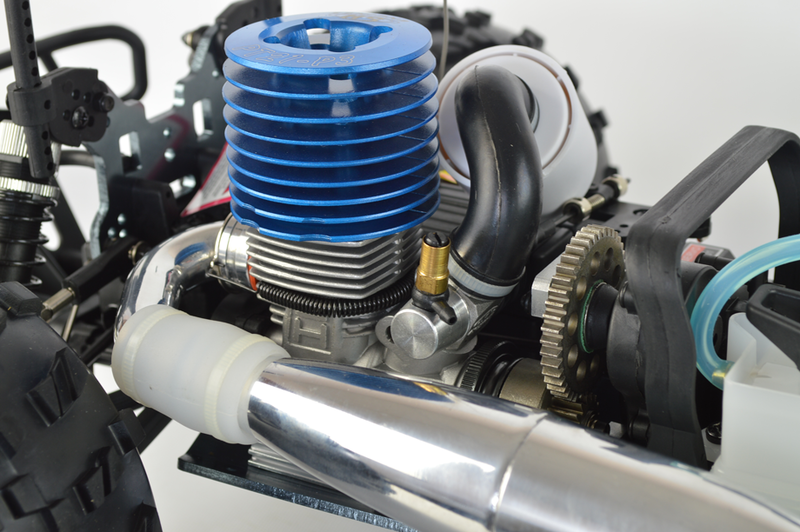 Fast SH 21 engine made in Taiwan to ensure the highest quality. Adjustable aluminium capped oil-filled shocks are mounted to aluminium towers that allow you to adjust the angle and tension. Sway bars are fitted as standard to further improve handling. Twin brakes give ultimate stopping power at high speeds. 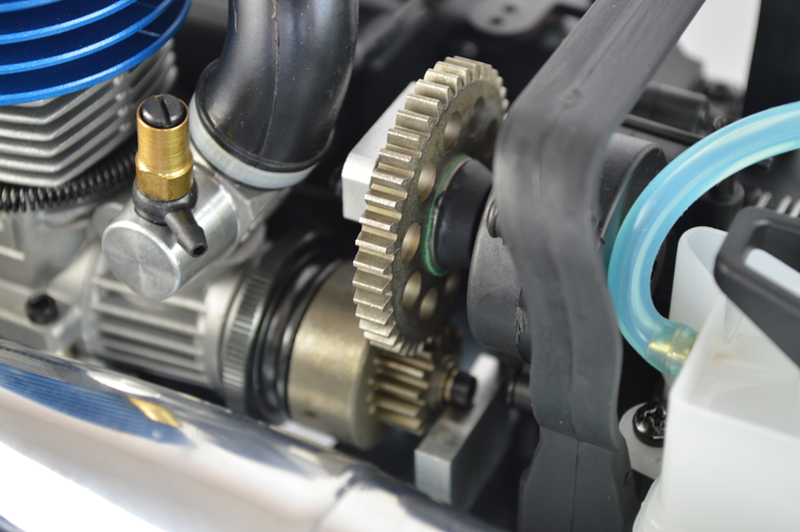 Gives faster accelleration in first gear and then switches to second gear for higher top speed. 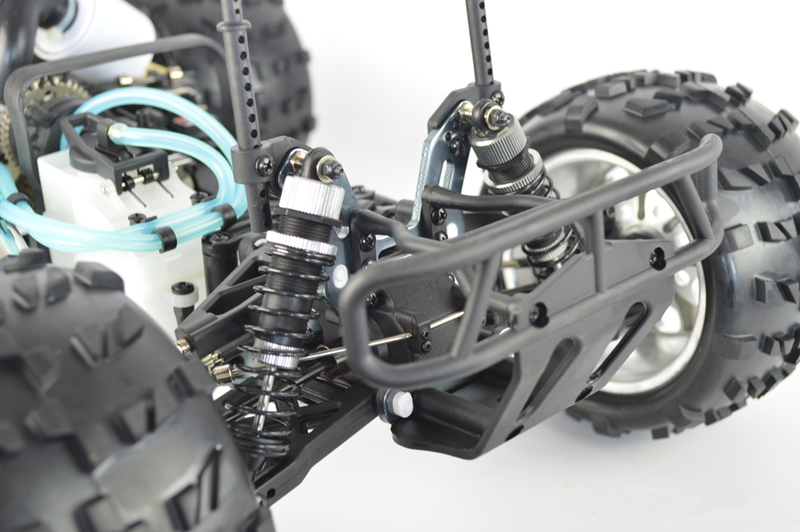 The wide aluminium chassis protects the insides and features countersunk screws that will protect your model from any rocky or bumpy terrain damage. Compact front and rear bumper providing extra protection in case of impact. Hi, it has a pull start. 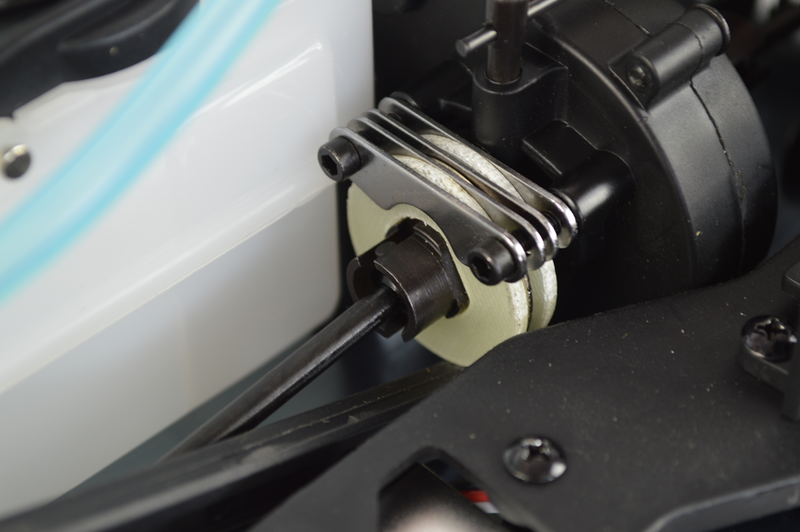 Very truck and great spec for the price.The sh 21 engine is fantastic.The carb settings are wrong out of the box both needles need to be set flush once set you can complete run in easily. Make sure you thread lock all metal screws that thread into metal. The 2 speed gearbox works great and is adjustable . The steering servo is very strong. Overall great truck very fast ,cheap spares and hop ups .